Most folks have some need for portable heating in their homes this time of year. If you’re conscious of safety and efficiency, this article is for you. These guys are pretty safe, if proper usage and common sense are used. However, they do pull some juice out of your wall sockets. They also get HOT, very HOT. You can’t touch the fronts of these guys. Don’t drop the newspaper on this guy either. It will ignite. Again, these are also relatively safe to use if you follow some common sense rules and the proper usage instructions. 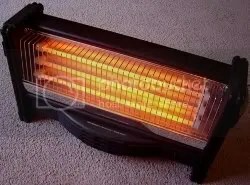 These type space heaters come in different wattages and number of fins. The higher wattage and higher number fins units are for larger areas in your home. I keep one of these in my hallway, which is centrally located in my house; and another in my front room, which is the coolest room in the house because it’s on the northern side. Together these two units will keep my entire house comfortable with no other heating source. Of course, I live in Central Florida. Having just two of these guys isn’t going to help you much in Minnesota in January. 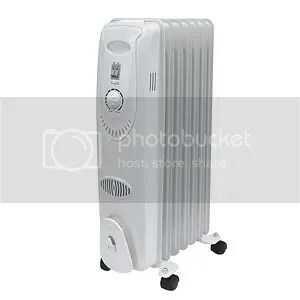 For safety and efficiency, these oil-filled radiator type space heaters are the way to go, in my opinion. They’re not that expensive either. Kmart, Walmart, or Sears usually have some good quality ones for $50-$90 dollars each. That’s well worth the little extra you’ll pay over the radiant or quartz type just for the peace of mind with regard to safety. You can set the newspaper right on top of one of these radiator units and it will NOT ignite. 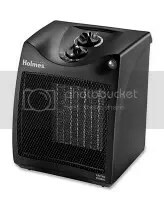 For some tips on using space heaters, see this article at eHow. That’s it for now, folks. Try to stay warm, wherever you are. Posted by V. T. Eric Layton on 2 December 2010 in Around the Home and tagged heaters, oil-filled, power usage, quartz, radiant, safety, space heaters.